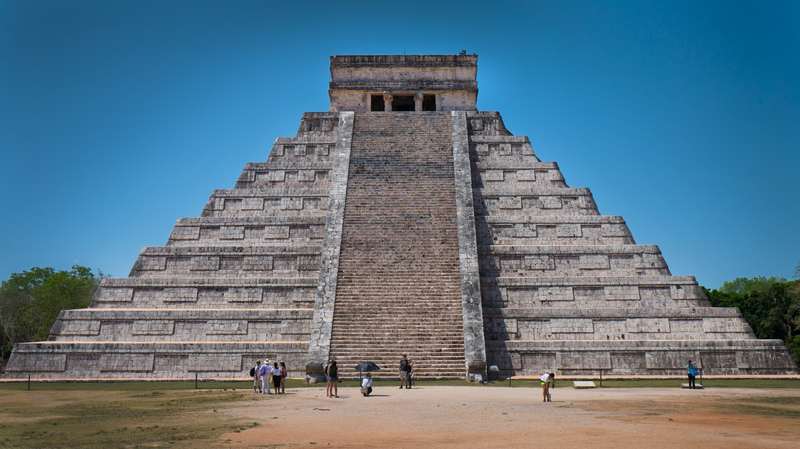 Brief: Photograph the landmarks and points of interest of the Mayan temples from my trip to Chichen Itza, Mexico. Equipment: Sony a5000, Sony E-Mount 18-55mm F3.5-5.6 lens. At the beginning of 2016 my luck hit and all time high as I was fortunate enough to win a holiday to Cancun, Mexico, from a competition I entered in 2015. Me and my girlfriend decided to go during the Easter holidays, to which I thought was the perfect opportunity to capture some great images for my assignment! We did many exciting activities but one of the perks of the trip was getting to explore the 5000 year old Mayan temples at Chichen Itza. I took many photographs on the day trip, here are my top 5. 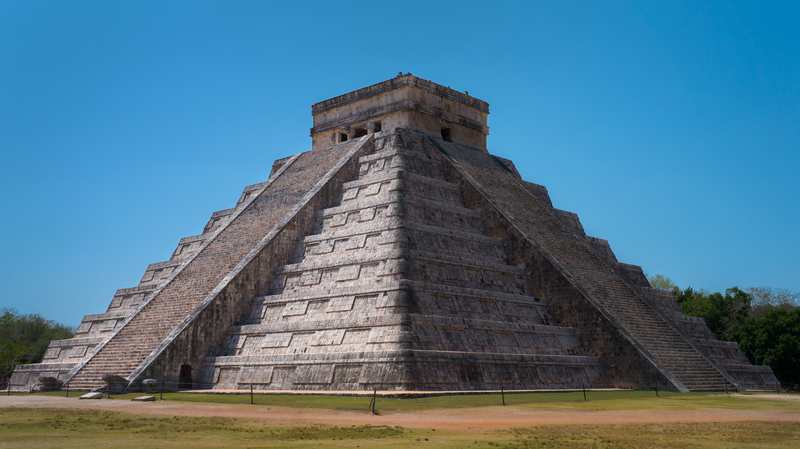 This is the main temple at Chichen Itza. Its design has one side facing the sun with segments between each step that shades the other side, giving this amazing light and dark effect. I really like this image as it shows a great example of that effect taking place, showing one half exposed and the other shaded. Having the composition of the temple straight down the middle, almost splits the image into two segments. 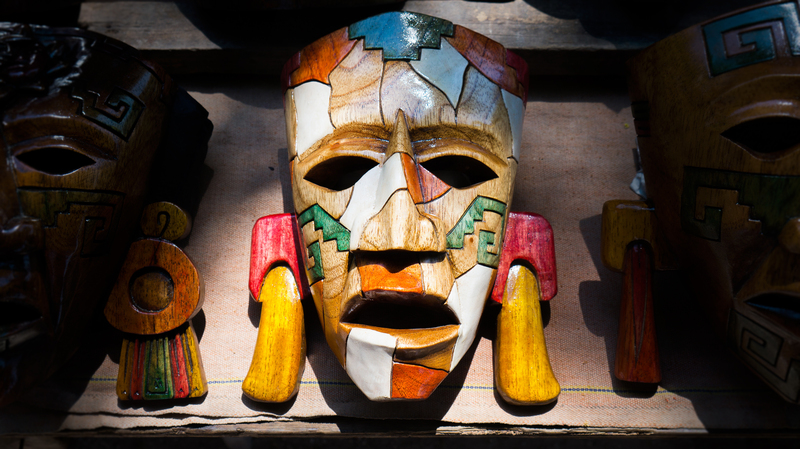 Whilst you walk around the site there are many market stalls that sell handcrafted wooden masks, these masks are suppose to resemble those that the Mayans would wear and decorate their constructions with. This mask was perfectly lit by a small gap of light shining through the forest trees, leaving the two on each side darkened by the shade. The details and colours are illuminated, making this image pop. Another photograph of the ‘light side’ of the Mayan temple. From this perspective you get an idea of how big the structure is with other tourists stood underneath it. This photo is made by the composition and symmetry, the stair case straight down the centre, then the zig-zag pattern either side of it work in harmony. 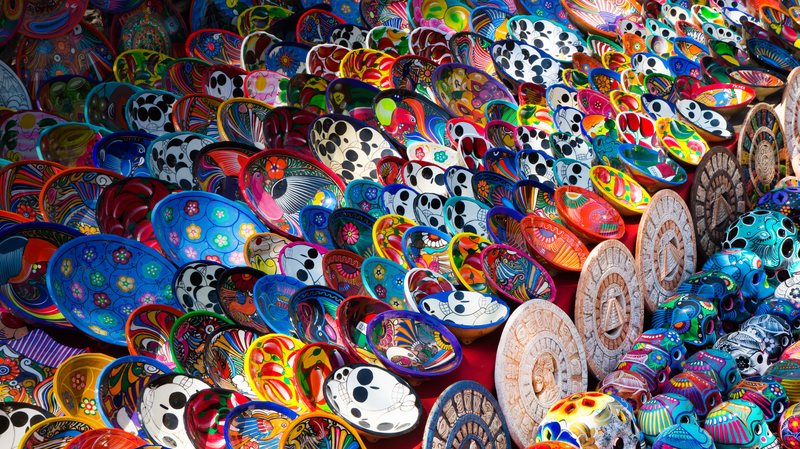 The market stalls also sell materialistic pieces such as clothing and bowls. This stall particularly caught my eye due to the amount of vibrant colours. This photo works for the reason, its vibrancy, as well as the pattern and structure of the layout. 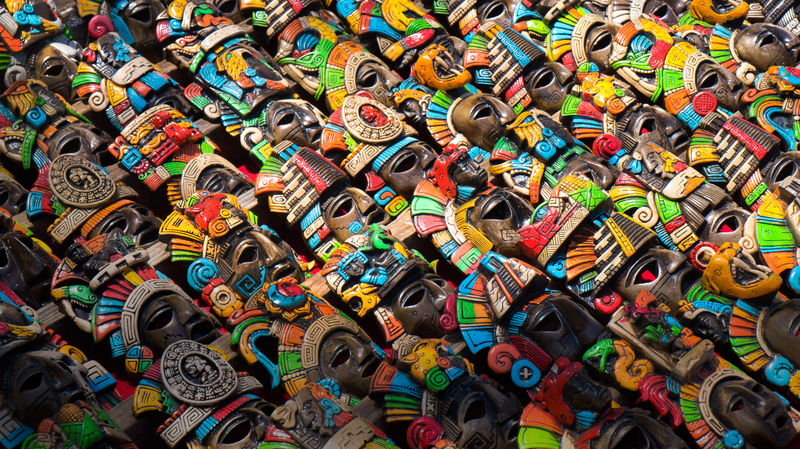 This stall sold small handcrafted wooden masks, similar to the previous photo the structure of the layout along with the vibrant colours makes this photo interesting to look at. Applying to both this image and the last one – I decided to use the photographs with higher aperture as I believed it looked better when the whole image was in focus, allowing you too see every detail. I have similar copies shot in f/3.5 that focus on the centre, leaving the fore/background out of focus, but didn’t have the same impact.